(CNN) -- Got an idea that could change the world, or at least help a lot of people? Google wants to hear from you -- and it will pay as much as $10 million to make your idea a reality. 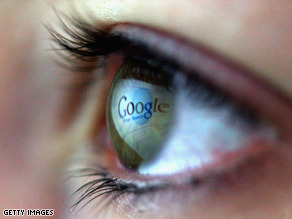 Google Inc. will award $10 million to solicit ideas it believes could benefit the world. To help celebrate its 10th birthday, the ambitious Internet giant is launching an initiative to solicit, and bankroll, fresh ideas that it believes could have broad and beneficial impact on people's lives. Called Project 10^100 (pronounced "10 to the 100th"), Google's initiative will seek input from the public and a panel of judges in choosing up to five winning ideas, to be announced in February. Google announced the project live on CNN on Wednesday morning. "These ideas can be big or small, technology-driven or brilliantly simple -- but they need to have impact," Google said in a news release. "We know there are countless brilliant ideas that need funding and support to come to fruition." Those are ideas such as the Hippo Water Roller, which Google cited as the kind of concept the company would be interested in rewarding. Developed in Africa, where it is most used, the Hippo Water Roller is a barrel-shaped container, attached to a handle, that holds 24 gallons of water and can be rolled with little effort like a wheelbarrow, making it easier for villagers on foot to transport critically needed fresh water to their homes. People are encouraged to submit their ideas, in any of 25 languages, at www.project10tothe100.com through October 20. Entrants must briefly describe their idea and answer six questions, including, "If your idea were to become a reality, who would benefit the most and how?" Funding, from a pool of $10 million, will be awarded in May. If the judges decide to reward five winning ideas, each will receive $2 million. If only two ideas are chosen, each will receive $5 million, and so on. A Google spokeswoman was reluctant to set parameters for the submissions, although the project's Web site suggests that successful ideas should address such issues as providing food and shelter, building communities, improving health, granting more access to education, sustaining the global ecosystem and promoting clean energy. "We don't want to limit it at all. We want a wide range of ideas," said Bethany Poole, product marketing manager at Google, who announced the project Wednesday on CNN along with Andy Berndt, managing director of Google's Creative Lab. "We think great ideas come from anywhere." To cite Google's own example, Google News began after the September 11 terrorist attacks, when an engineer became frustrated that he couldn't aggregate news sources from around the world in one place. By opening the project to anyone -- not just laboratories or universities -- Google is embracing "crowdsourcing," the Internet-age notion that the collective wisdom of mass audiences can be leveraged to find solutions to design tasks. Project 10^100 is not unlike the Google-sponsored Lunar X PRIZE, a $30 million international competition to safely land a robot on the surface of the moon, travel 500 meters over the lunar surface, and send images and data back to Earth. The first team to land on the moon and complete the mission objectives will be awarded $20 million. At least 16 teams are competing. Those who submit winning Project 10^100 ideas will not be required to have the technical expertise to implement them, Poole said. Google has not determined how winning projects will be sustained financially after the initial prize money runs out, she said. People may submit more than one idea. Through its online submissions, Google also hopes to connect people with good ideas to charitable organizations who could help implement them, Poole said.